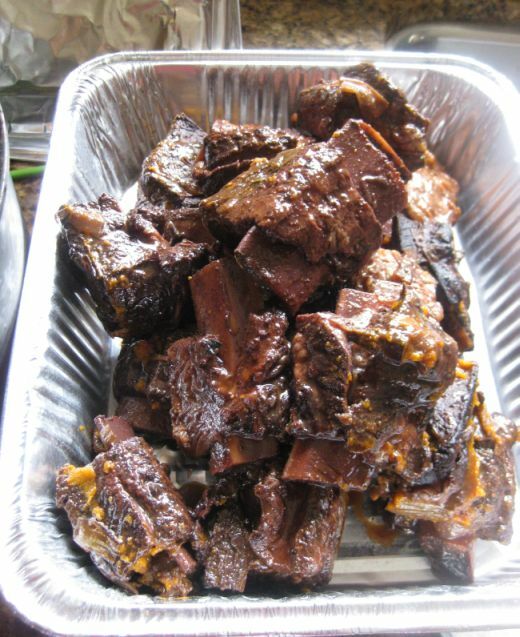 Short ribs are originally a comfort and homey dish served mostly at home but lately this dish is enjoying their moment in the spotlight! 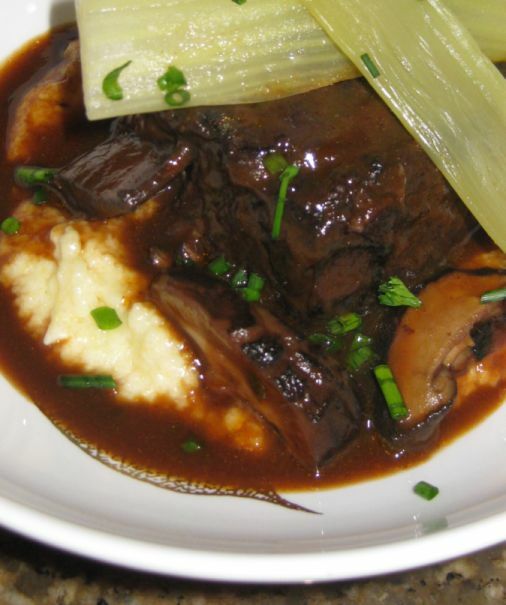 The meat is braised slowly in the oven and yield a tender, succulent braised short ribs that are much in demand and are becoming a hit in the U.S. Short ribs are cooked along with vegetables in wine and then braised vegetables are put in the blender along with the broth to extract all the flavors. 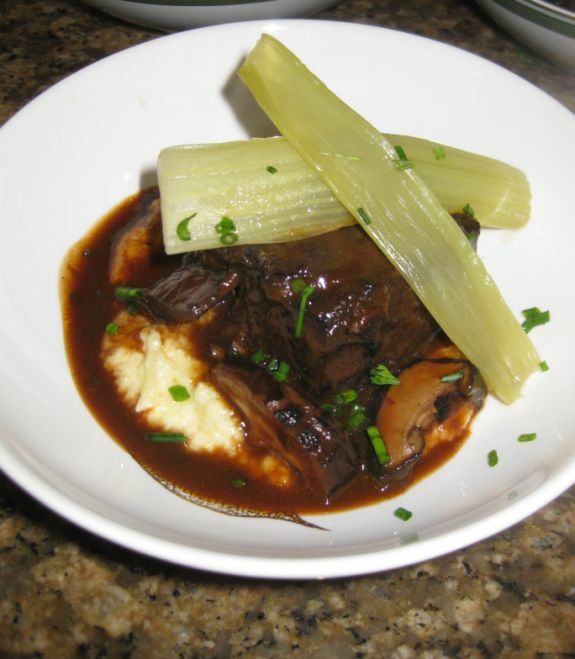 Here I am pairing my braised short ribs with a creamy polenta and I then I am serving it with a couple of braised celery stalks. 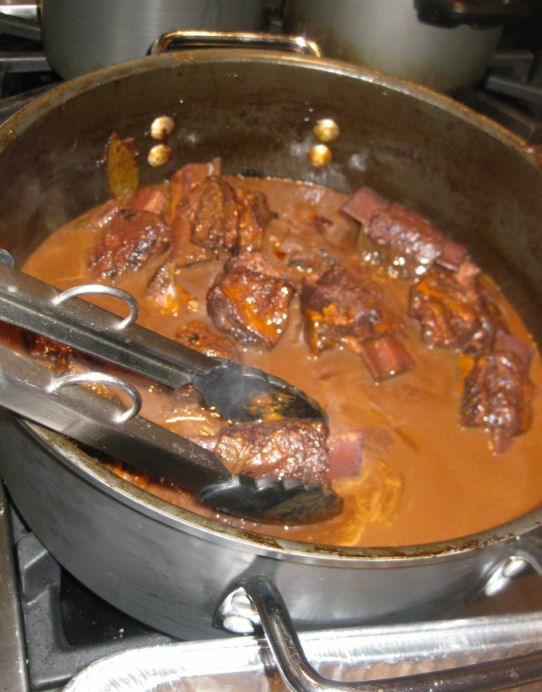 The success of this dish depends on browning the meat well at the start and tending the meat during its braising time to get the best flavor from the sauce. 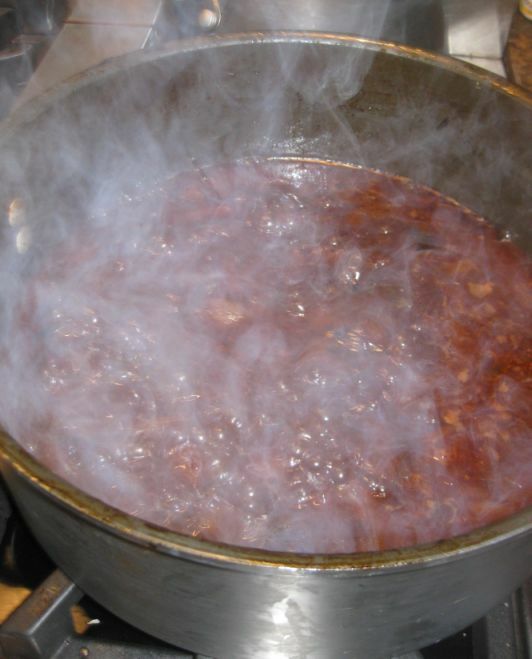 You will need to be diligent with the sauce about skimming off the fat that rises to the surface while it is cooking. 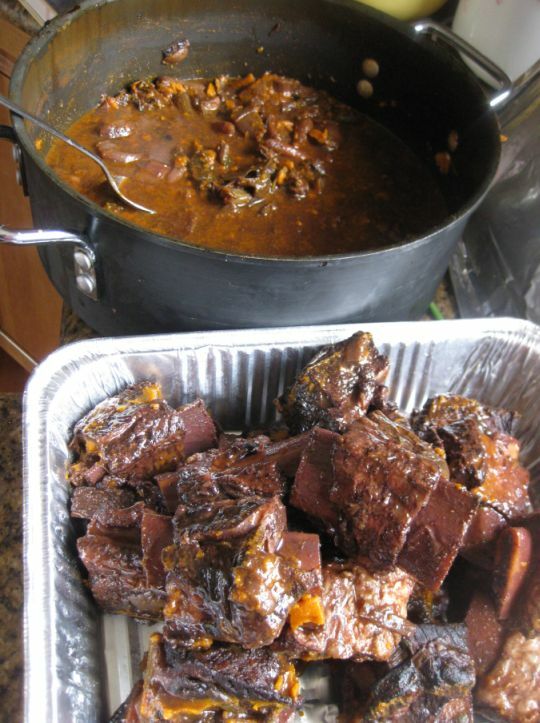 This is a great dish to serve when you have a party because it takes nicely to be made ahead: Do the cooking one day ahead, reheat the dish the day of the party leaving you plenty of time to do other things on the day of the party. 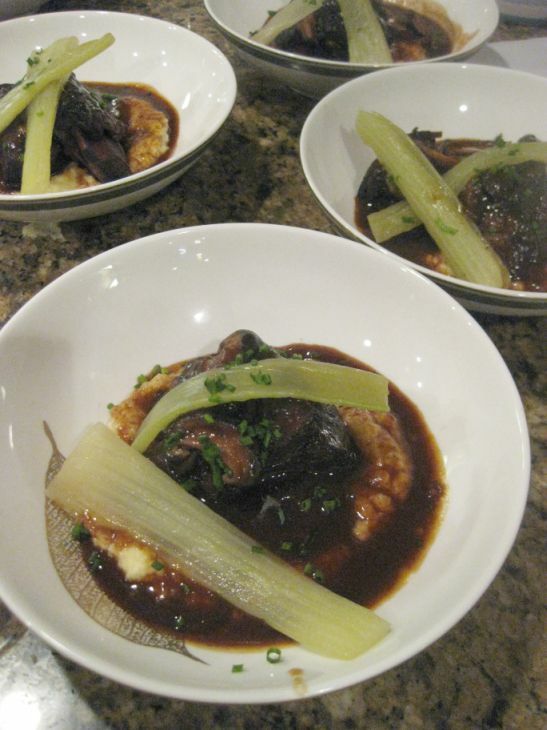 The dish is great with good glass of burgundy... simply delicious! 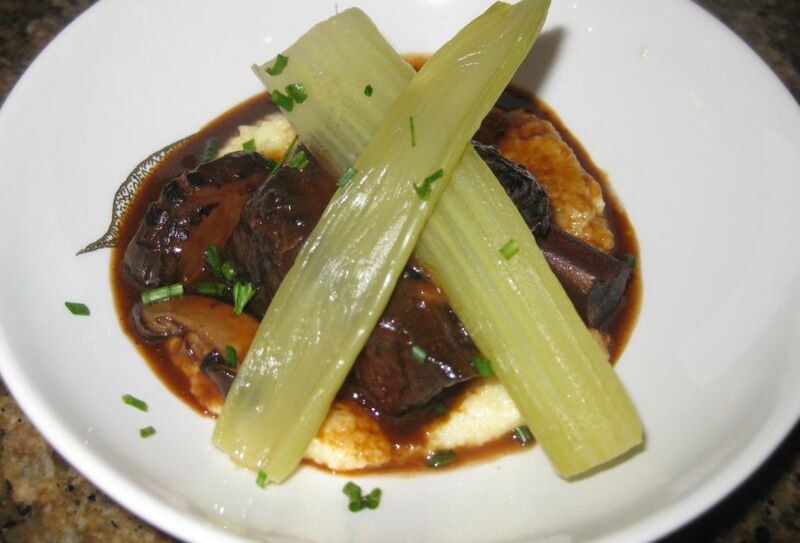 Adding the braised celery stalks to dish gives it another layer of texture. 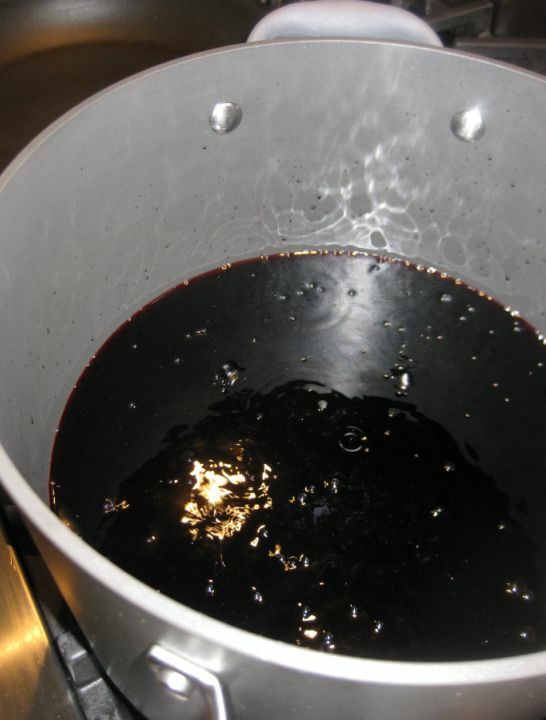 Pour the wine into a large saucepan set over medium heat. 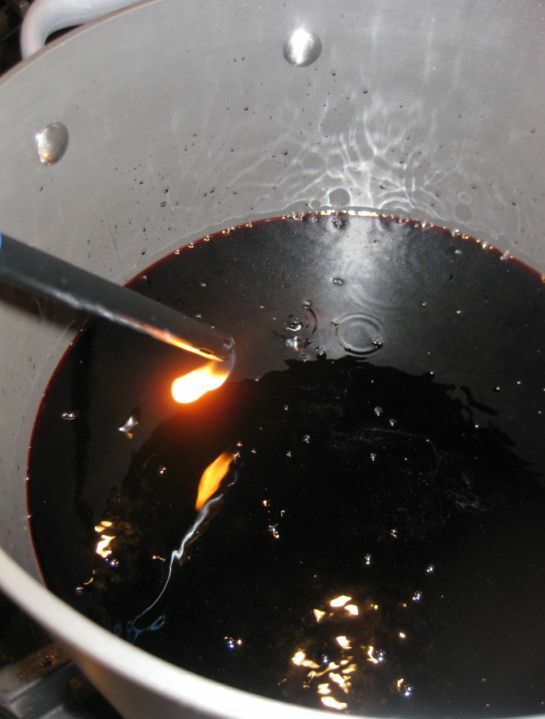 When the wine is hot, carefully set it aflame. 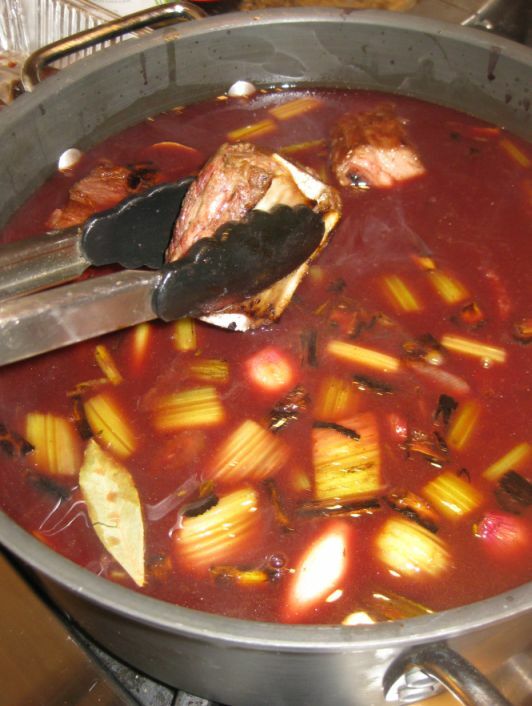 Let the flames die out, then increase the heat so that the wine boils, allow it to boil until it cooks down by half. Remove from heat. 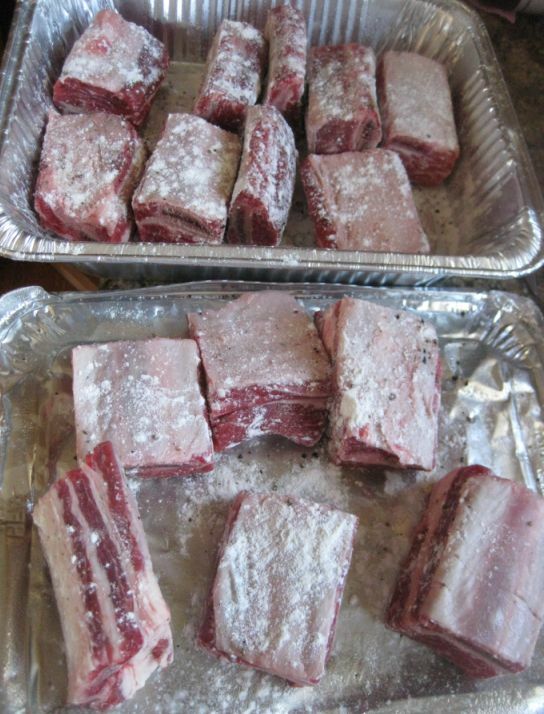 Dust the ribs with a bit of flour. 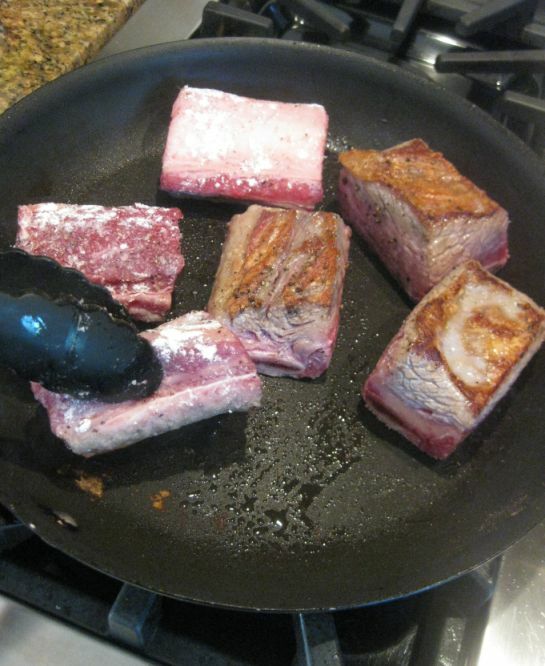 Put the ribs is an oiled pan and sear for 4 to 5 minutes on a side. Rotate the ribs around so they are browned evenly. Set aside. 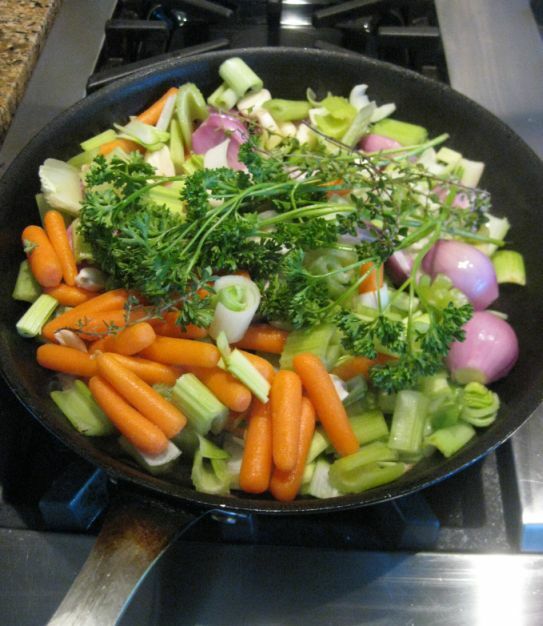 Toss the vegetable in an oiled pan and sauté until lightly browned about 5 to 7 minutes. 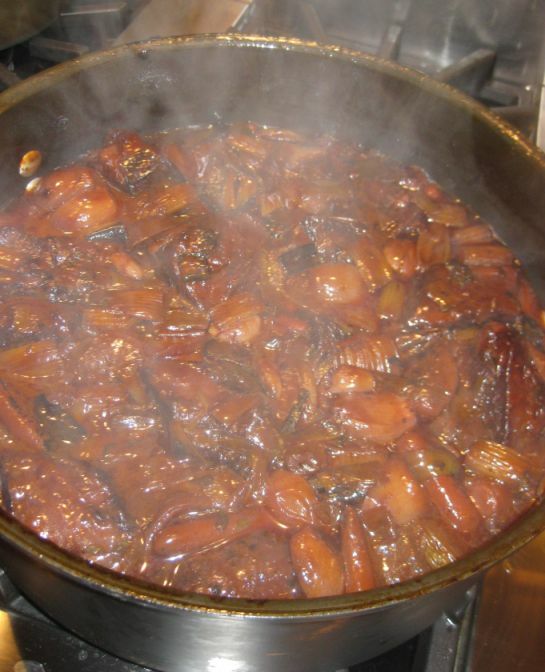 Then stir in the tomato paste and cook for 1 minute to blend. 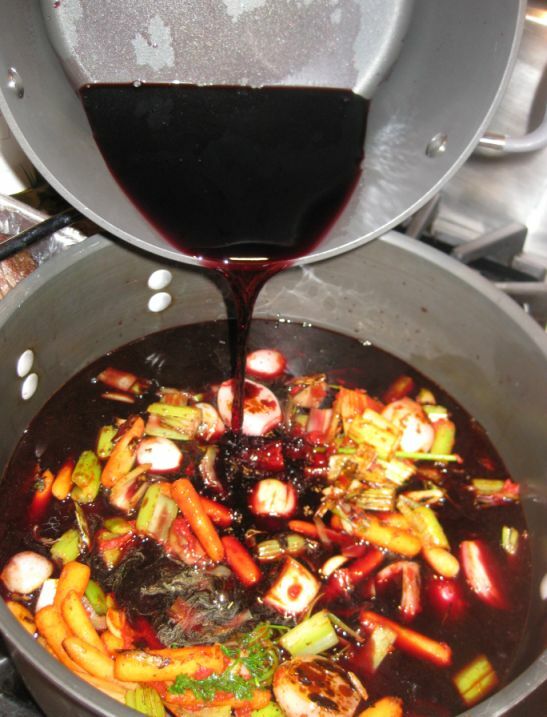 Add the vegetables to the reduced wine. 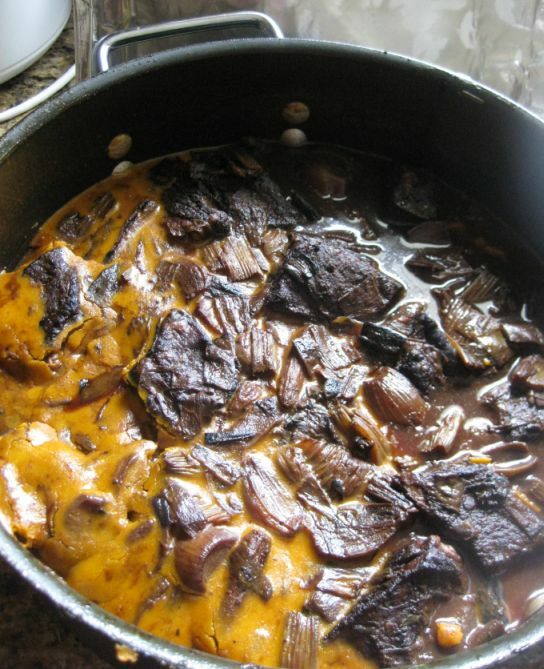 Add the browned short ribs to the pot. Turn the oven on at 350 degrees. 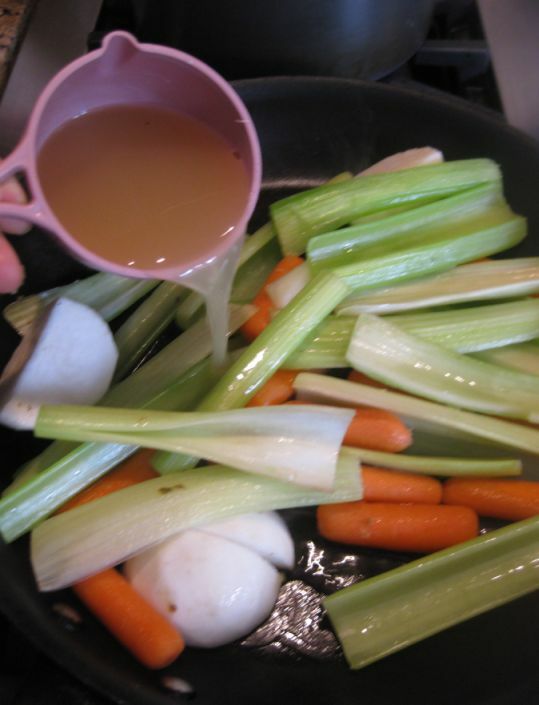 bring the pot to a boil on your stove top. Cover the pot with a lid and put it in the oven for about 2 1/2 hours. Every 30 minutes or so, lift the lid and skim and discard whatever fat may have bubble up to the surface. Let the pan cool down. 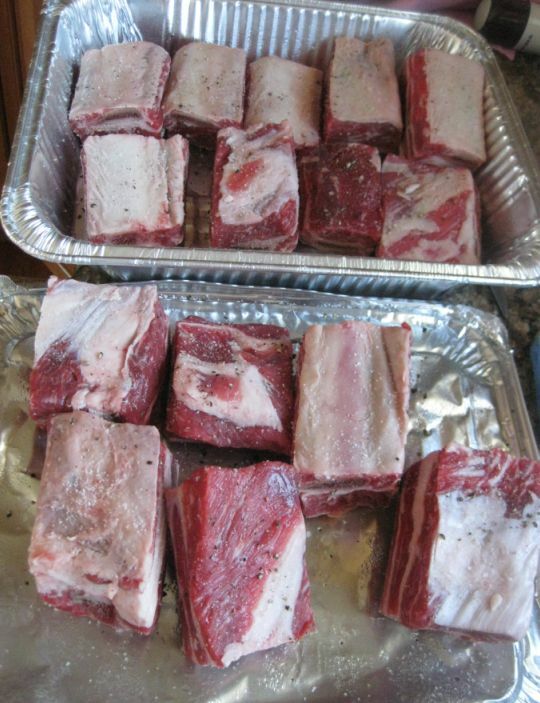 Chill the ribs and stock in the pan overnight. Best to make this dish 1 day ahead. 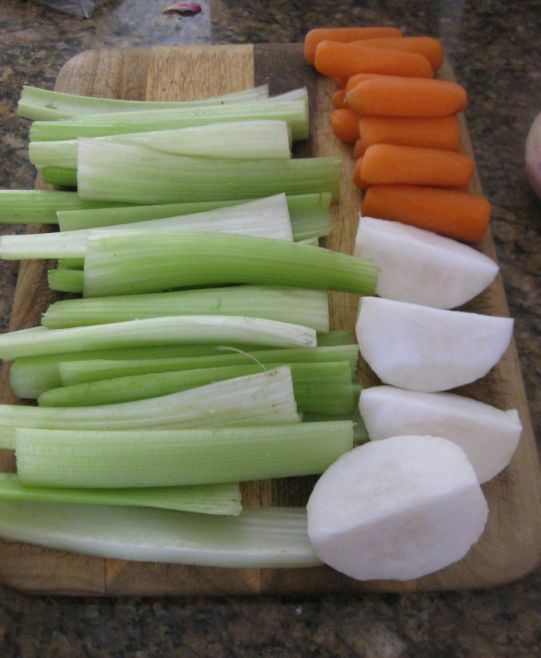 Trim the bottom of each celery, cut the celery to measure 4 to 5 inches long. 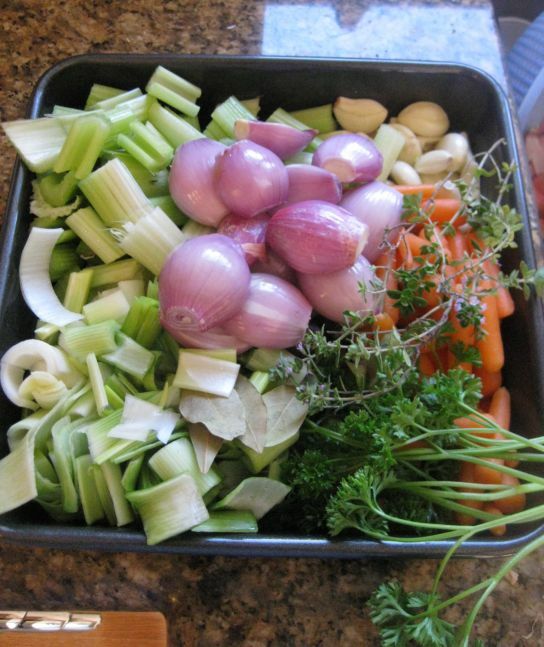 Run a vegetable peeler over the exterior of the outer stalks to remove the stringy part of the vegetable. Cut the turnip into quarters. Clean your carrots. 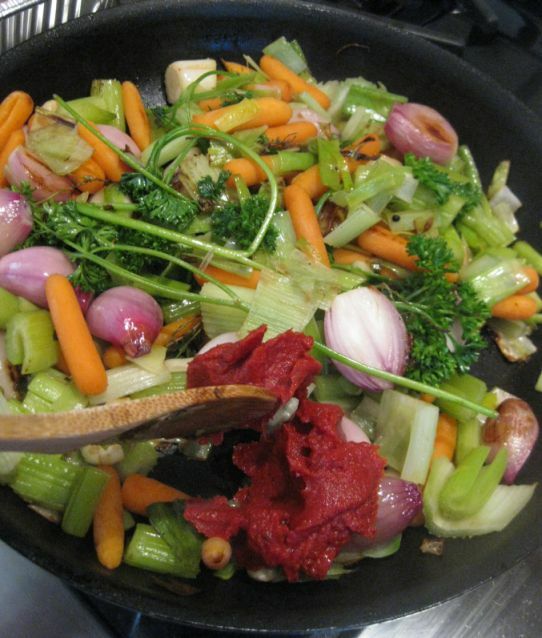 In a large sauté pan over medium heat add the all the vegetables. 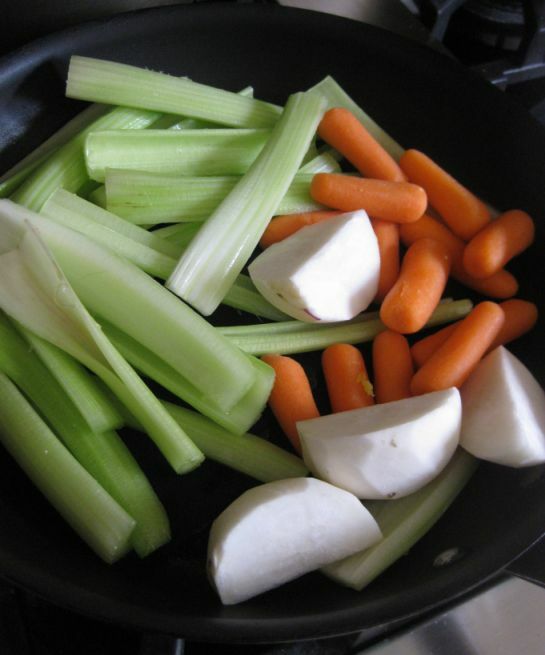 Season with salt and pepper and cook without coloring the vegetables for about 3 minutes. 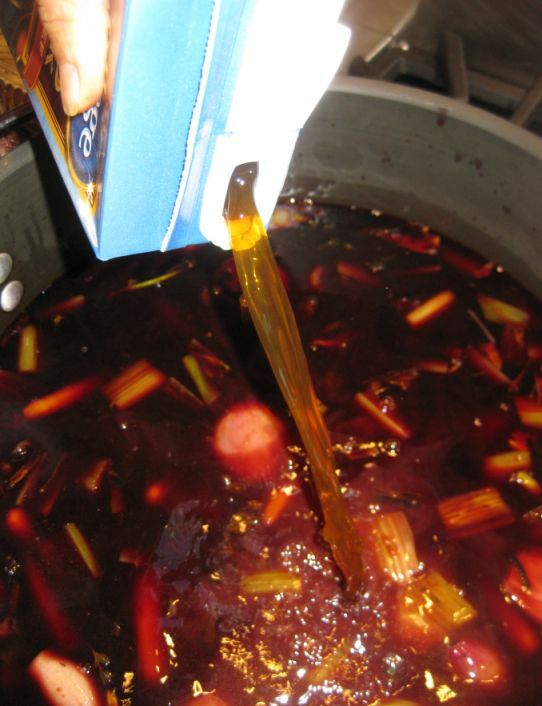 Pour the stock and bring to a boil. 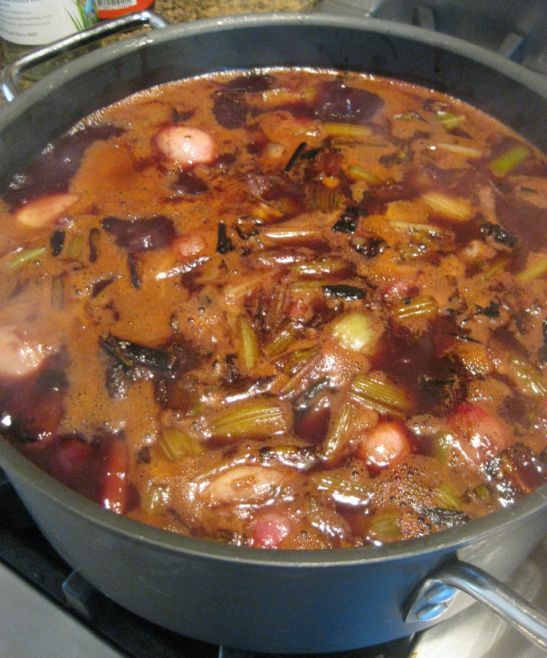 Adjust the heat so that the stock simmers steadily and cook the vegetables for about 25 minutes. 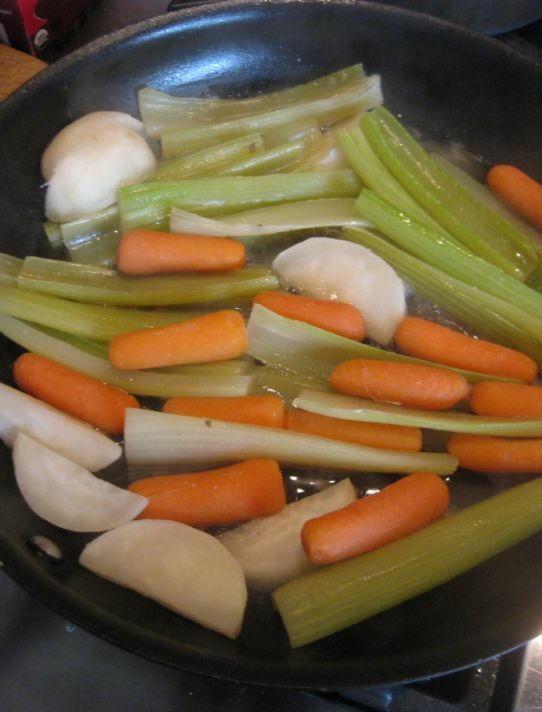 When the vegetables are tender, the liquid should be about gone, so that you should have tender vegetables lightly glazed with the stock. Remove and discard the turnip and carrots. The next day scrape off the fat. 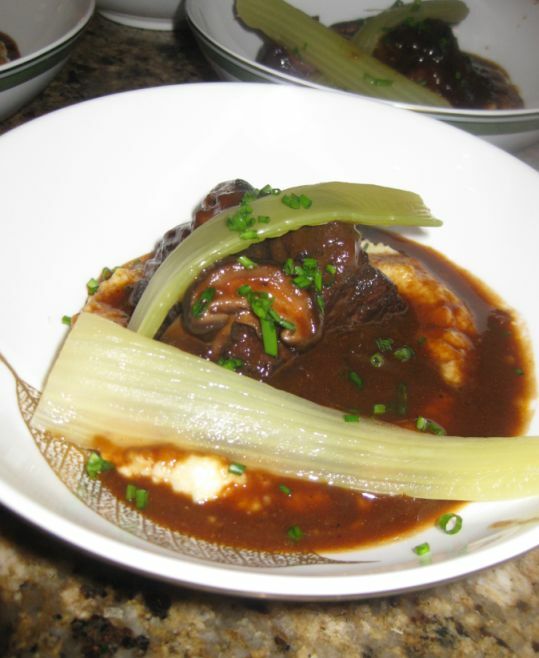 Remove the short ribs and set aside. They are definitely tender and falling off the bone. 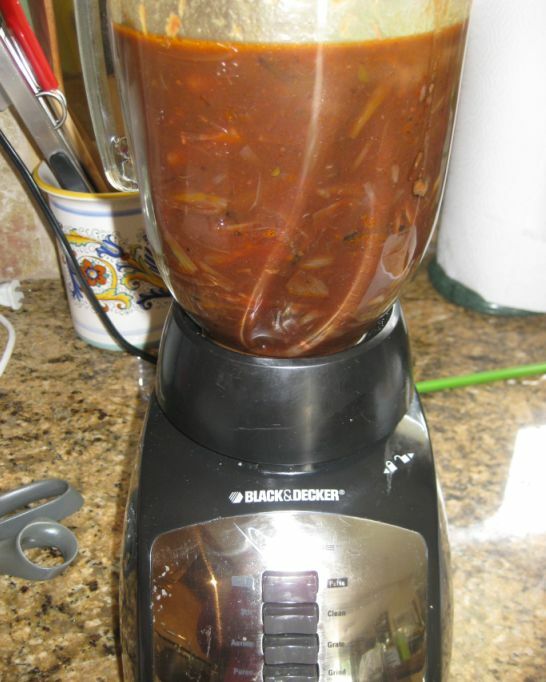 Put the broth in a blender and pass the liquid through a sieve and discard the solids. 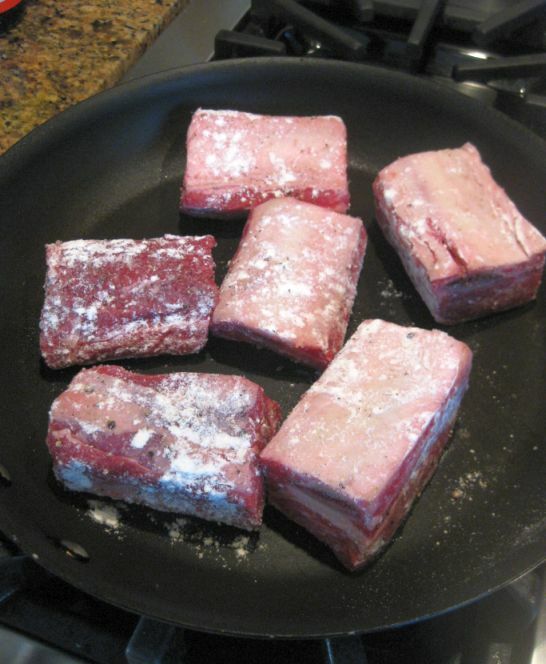 Pour the sauce back in the pan and add the short ribs. Reheat the pan. Taste and season accordingly. It is ready to be served.